• The first major exhibition in the UK to consider artists’ responses to war and conflict since 9/11 opens at the Imperial War Museum in Lambeth today. Age of Terror: Art since 9/11 features 50 works of art including film, sculpture, painting, installations, photography and prints from more than 40 British and international contemporary artists including Ai Weiwei, Grayson Perry, Gerhard Richter, Jenny Holzer, Mona Hatoum, Alfredo Jaar, Coco Fusco and Jake & Dinos Chapman. The exhibition is presented around four key themes – artists’ direct or immediate responses to 9/11, issues of state surveillance and security, our relationship with firearms, bombs and drones, and the destruction caused by conflict on landscape, architecture and people. Highlights include Iván Navarro’s The Twin Towers (2011), Ai Weiwei’s Surveillance Camera with Marble Stand (2015), and James Bridle’s site-specific installation, Drone Shadow Predator, as well as Grayson Perry’s Dolls at Dungeness September 11th 2001 (2001) and, Jamal Penjweny’s photographic series, Saddam is Here (2009-2010). Runs until 28th May. Admission charge applies. For more, see www.iwm.org.uk/ageofterror. • The first UK retrospective of the work of famed 20th century Finnish illustrator Tove Jansson opened at the Dulwich Picture Gallery yesterday. Tove Jansson (1914-2001) celebrates the work of the artist known as the creator of the Moomin characters and books but also includes a wider looks at her graphic illustration work and paintings. It features 150 works including self-portraits, landscapes and still-lives never seen before in the UK and a series of Moomin drawings only discovered at the British Cartoon Archive this year. Organised in collaboration with the Ateneum Art Museum, the exhibition can be seen until 28th January. Admission charge applies. For more, see www.dulwichpicturegallery.org.uk. 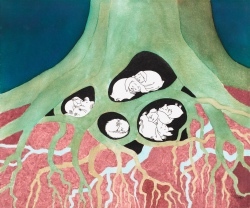 PICTURE: Tove Jansson, Sleeping in the Roots, 1930s, Moomin Museum, Tampere Art Museum Moominvalley Collection (Finnish National Gallery/Yehia Eweis). • Featuring 50 painted objects created over 700 years, a new exhibition at The National Gallery takes a “radical” look at what happens when artists cast aside the colour spectrum and focus on the power of black and white. Monochrome: Painting in Black and White features paintings and drawings by Old Masters like Jan van Eyck, Albrecht Durer and Rembrandt van Reign alongside works by contemporary artists such as Gerhard Richter, Chuck Close and Bridget Riley. Exhibition opens on Monday and runs until 18th February. Admission charge applies. For more, see www.nationalgallery.org.uk.